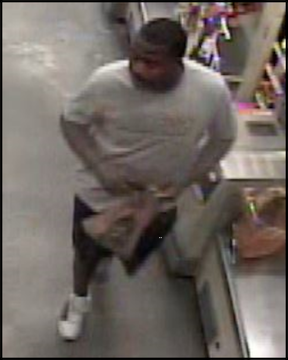 PLANO, TX - The suspect pictured below used the victim’s credit card to make unauthorized purchases at a Home Depot and a Kroger. It is unknown how the victim’s credit card information was compromised. If you have any information about this case, you may report tips using the above link, or call Crime Stoppers at #877-373-8477. Tipsters are eligible for a reward of up to $5,000 and may remain anonymous. This offense is documented on Plano Police case #18-147057. PLANO, TX - The suspects pictured below went to ten different DFW area cities between 4/17/18 and 4/19/18 and withdrew a large sum of money from the victim’s bank account. The suspects used Woodforest bank branches located inside Walmart. Three of the withdrawals occurred in Plano within an hour of each other. Review of bank surveillance video indicated there were two different suspects making the withdrawals. The black male made withdrawals in 8 cities; the White male made withdrawals in 2 cities. Both suspects presented fraudulent Texas driver’s license depicting themselves as the victim which allowed them to withdrawal the funds. The suspects parked across the street and out of camera range at each location so no vehicle information was obtained. This offense is documented on Plano Police case #18-79167. DALLAS, TX - The Dallas Police Department is seeking the public’s assistance in identifying two burglary suspects that were captured by the victim’s surveillance video. 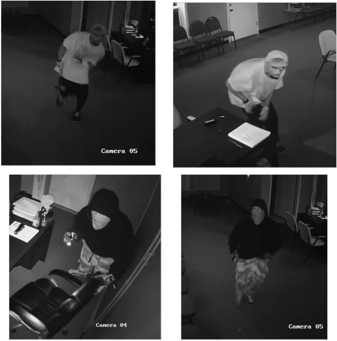 On July 13, 2018 at approximately 1:20am, the suspects, pictured below, forced entry into an insurance company located in the 2500 block of S. Buckner Blvd. The suspects then used a sledge hammer to open the victim’s safe and took approximately $2,000.00. It is believed the suspects are responsible for multiple burglaries of insurance companies in the Pleasant Grove area of southeast Dallas. This offense is documented on Dallas Police case #152786-2018. PLANO, TX - On July 16, 2018, multiple suspects entered into a residence by forced entry in the 2100 block of Red Bud Lane, wearing ski masks and gloves. Based on video evidence, It appears the suspects may have been armed. No one was home when the suspects ransacked the residence and committed a burglary. This offense is documented on Plano Police case #18-129930. 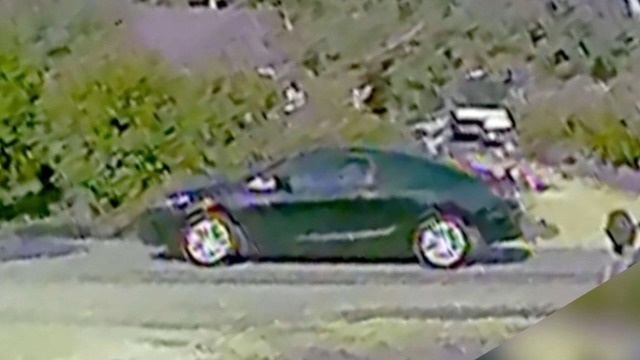 The video surveillance camera captured the depicted vehicle fleeing the offense location (click on picture of Suspect's Vehicle below). PLANO, TX - On March 17, 2018, suspects forced entry into a business and attempted to break into a cash drawer. The suspects were unable to access the drawer and then left the location. It is believed these suspects are part of a group that has been targeting loan service businesses across the nation. Suspects in this incident are described as black males dressed in dark clothing wearing gloves and covering up their faces with masks or other clothing items. If you have any information about this case, you may report tips using the above link, or call Crime Stoppers at #877-373-8477. Tipsters are eligible for a reward of up to $5,000 and can remain anonymous. This offense is documented on Plano Police case #18-47742. PLANO, TX - On February 7, 2018 at approximately 4:40pm, Plano Police Officers responded to a report of a male subject laying in the roadway in the 6800 block of U.S. Highway 75, just south of Legacy Drive. Upon officer’s arrival, they located a subject who appeared to have been hit by a vehicle. It is believed the victim may have been a pedestrian walking along the shoulder of the highway. The victim was transported by Plano Fire Rescue to a local area hospital where he later died from his injuries. The victim was identified as John Curtis Shelby, a 36-year old white male. He was wearing brown pants, blue striped button-down shirt and had a shaved head and a full beard. Plano Police Traffic Investigators are seeking assistance from the public for anyone who may have witnessed this victim being struck by a vehicle and are asking them to contact Crime Stoppers. This offense is documented on Plano Police case #18-24639. PLANO, TX - On February 14, 2018 at approximately 12:55am, Plano Police Officers responded to a report of gunshots in the 4200 block of McAlice Drive. Upon Officers’ arrival, a subject was located in front of a residence with multiple gunshot wounds. That subject was pronounced deceased. Further investigation determined that the victim was a small business owner in Dallas and had been the target of a Robbery. The deceased has been identified as Ahmed Omar, a 56-year old Plano resident. This offense is documented on Plano Police case #18-28211. PLANO, TX - The suspect pictured below gained access to the victim’s personal information and opened several credit cards. The suspect then retrieved the credit cards from the victim’s mailbox and made fraudulent purchases using the credit card. The victim’s personal information was also used to open a TD Ameritrade account. The suspect is a black male and believed to be driving a white sport utility vehicle. This offense is documented on Plano Police case #18-73077. PLANO, TX - The Plano Police Department is seeking assistance from the public regarding an Aggravated Assault investigation. On January 12, 2018, officers responded to the 3400 block of Tarkio Road where it was determined a victim had been a victim of an aggravated assault. It was reported that two black males wearing masks entered into the residence at this location and assaulted the victim. The suspects then fled the location prior to police arrival. This offense is documented on Plano Police case #18-7248.